Commanding and powerful, the Le Manns collection draws inspiration from late eighteenth century Federalist and Neoclassic style to impress with its dignified grandeur. 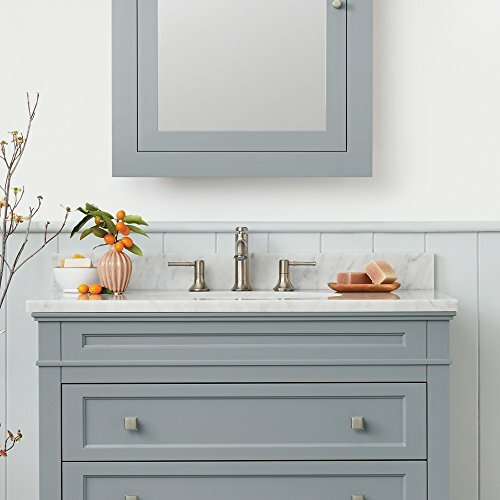 The Le Manns vanity top coordinates perfectly with the uniquely carved body of the Le Manns bathroom vanity cabinet (sold separately), accommodating a Neoclassical silhouette with its curved sides, jutting column details, and ogee edging for a touch of classical charm. 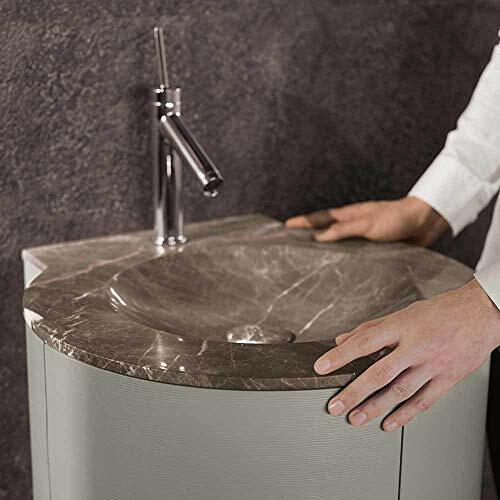 Elegant Natural Marble and Granite Our natural stone countertops, available in granite and Carrara marble, bring an effortless air of refinement to your bathroom vanity set. 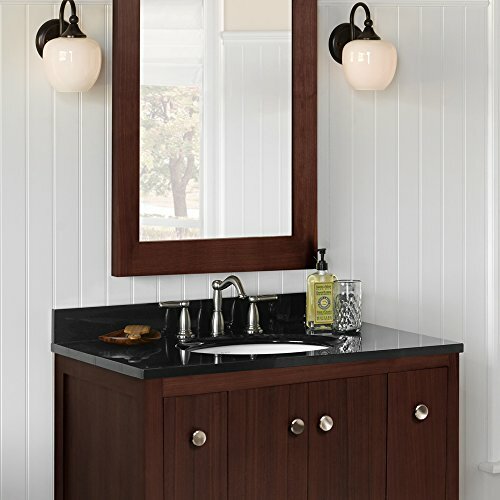 Because the stone is mined from nature, no two pieces are alike, offering your bathroom vanities a unique, one-of-a-kind look. Natural stone countertops boast nearly invisible seams, and will last several years if cleaned consistently and sealed yearly. 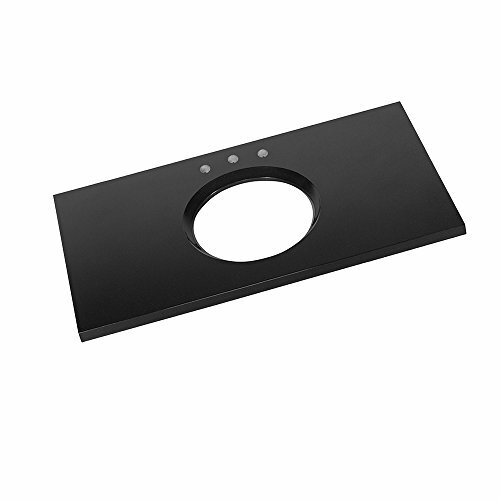 301137-8-AB Finish: Absolute Black Granite Features: -Counter top.-Stone top for undermount sink with 8'' oc faucet holes. Options: -Available in absolute black granite, carrara white marble or cream beige marble finish. Construction: -Stone construction. Dimensions: -Overall dimensions: 8.438'' H x 37'' W x 22.25'' D. Warranty: -Manufacturer provides one year warranty against all defects. 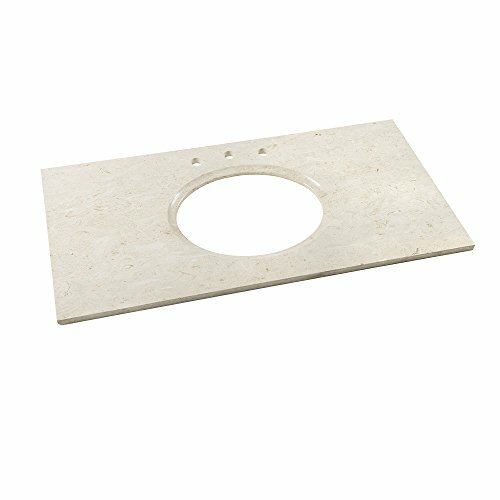 301149-8-CW Top Finish: Carrara White Marble Features: -Counter top.-Stone top for undermount sink with 8'' oc faucet holes. Construction: -Stone construction. 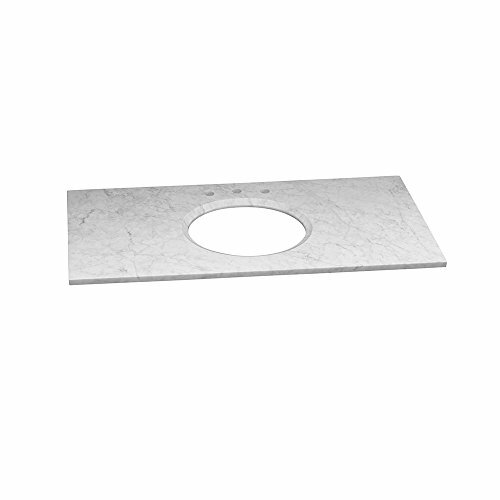 Dimensions: -8.438'' H x 49'' W x 22.25'' D. Warranty: -Manufacturer provides one year warranty against all defects. 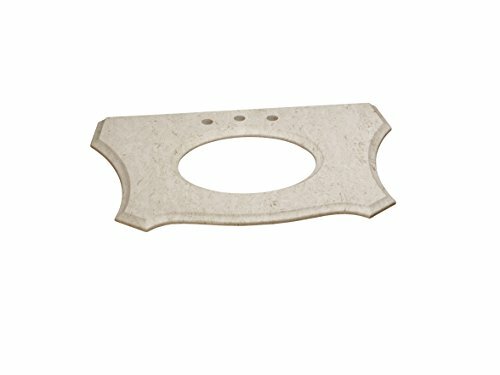 19" Waterspace Round Stone Sinktop without Overflow in Pietra Gray Marble LBA0825202The Waterspace sinktop celebrates the fusion of clean minimalism with elegant finishes. Available in several fine marbles or hand-fired ceramic options, the Waterspace's perfectly circular silhouette is accented by one straight edge and a gently scooped, spherical basin, all carved out of one solid piece of stone for a truly one-of-a-kind look. 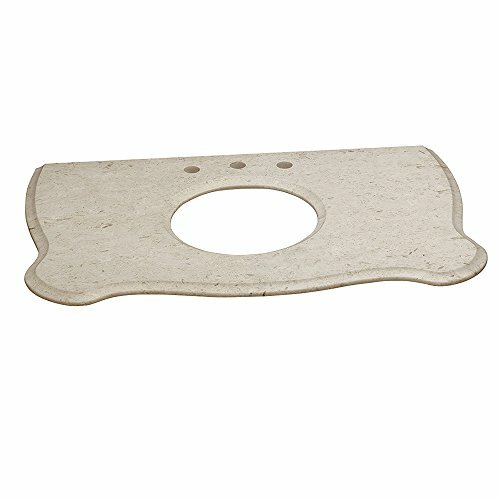 301137-8-MY Top Finish: Cream Beige Marble Features: -Counter top.-Stone top for undermount sink with 8'' oc faucet holes.-Distressed: No.-Overall Height - Top to Bottom: 8.438.-Overall Width - Side to Side: 37.-Overall Depth - Front to Back: 22.25. Construction: -Features:Stone construction. 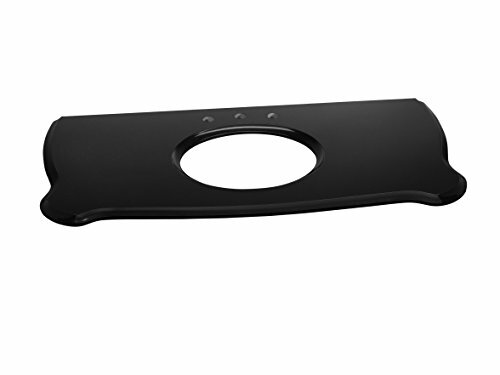 Dimensions: -8.438'' H x 37'' W x 22.25'' D. Warranty: -Manufacturer provides one year warranty against all defects. 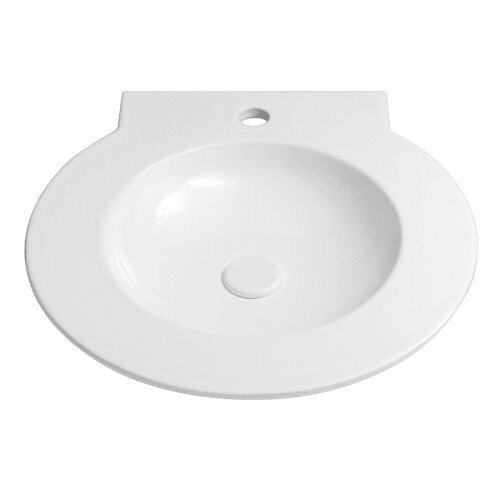 20" Waterspace Ceramic Round Sinktop without Overflow in White LBA0825201The Waterspace sinktop celebrates the fusion of clean minimalism with elegant finishes. Available in fine marbles or hand-fired ceramic options, the Waterspace's perfectly circular silhouette is accented by one straight edge and a gently scooped, spherical basin, all carved out of one solid piece of stone for a truly one-of-a-kind look.